Three bright California poppies framed by bright greens. 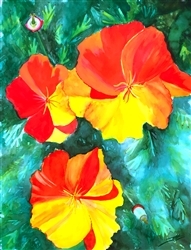 Original watercolor on watercolor paper, unframed. 18"X24"
Copyright © wildwhims.com. All Rights Reserved.